Home Titanic Survivors Thomas Arthur Whiteley Why did White Star settle with Whiteley? THOMAS Whiteley was an unimportant member of crew on the latest White Star liner. He was only eighteen, a solid and presentable youth with some small experience. He had previously served as a steward on the RMS Olympic. Whiteley found himself transferred to the second sister for her inaugural crossing. As a first class saloon steward, the Manchester-born manciple might have thought himself ideally placed to enjoy a few nice tips. And maiden voyages always brought the high rollers. Of course it all went horribly wrong. Right from the moment when, as he later told the North Berks Herald, old ship's surgeon William O'Loughlin had risen from his seat at the Wideners' dinner party on the Sunday night to propose a toast to the mighty Titanic. A few hours after that moment of gaiety Whiteley found himself in a maelstrom of life and death on a boundless, malevolent ocean. Somehow he reached the sanctuary of a boat in the darkness. Dawn saw him lifted exhausted aboard the Carpathia. Thomas Whiteley fractured a limb in the terror. When other crew went home to England, Whiteley remained in St Vincent's Hospital in New York. Ten days after the disaster he was one of only three crew members who were still detained in hospital. The Times claimed he had a broken arm. But a bedridden Whiteley had already begun to wield a powerful influence on the story of the disaster. Whiteley's story, given the full banner-headline treatment, was sensational indeed. He claimed that the Officers of the Watch of the Titanic had been warned in advance by the lookouts of a deadly obstacle course of ice that lay across their path. 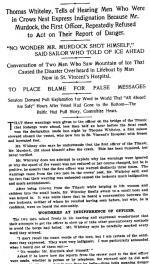 "That three warnings were given to the officer on the bridge of the Titanic that icebergs were ahead, less than half an hour before the fatal crash, was the declaration made last night by Thomas Whiteley, a first [class] saloon steward who now lies in St Vincent's Hospital with frozen and lacerated feet. There are some obvious problems with Whiteley's allegations. Leaving aside the question of which boat he himself was saved in, his claim is substantially that the two lookouts on watch at the time of the collision - Fred Fleet and Reg Lee - were together in the same lifeboat. But in fact Fleet asserted that he was saved in lifeboat 6 whereas Lee escaped in lifeboat 13. Fleet's presence in number 6, which did not pick up anyone from the water, is corroborated in evidence by Robert Hichens and Arthur Peuchen. Similarly, Lee's presence in 13 seems well grounded. This craft did not pick up anyone either. There is little basis for belief that any of the other lookouts who were not on duty at the critical time - Hogg, Jewell, Evans or Symons - could have been an 'other lookout' to hear complaints from either Lee or Fleet. All were in different boats, apart from Hogg and Jewell, who were both saved in lifeboat 7, said to be the first boat away. Neither Hogg nor Jewell could have made the remarks, since neither was on watch at the time, nor could Whiteley have entered their lifeboat. In any case, Fleet told the US Inquiry that Jewell and Symons, the earlier lookouts, had not reported seeing any bergs, but just passed on the message to keep a keen eye out for them. Nor had Hogg and Evans seen anything, he said. Senator Smith: Did you see any other icebergs; field ice, or growlers while you were in the crow's nest Sunday or Sunday night? Fleet: Only the one I reported right ahead. Senator Smith: Only that one? 2419. Before half-past eleven on that watch- that is, seven bells-had you reported anything at all, do you remember? Lee - There was nothing to be reported. While it could be maintained that Fleet and Lee were upholding a company line by the time they took the stand - "He would say that, wouldn't he?" as Mandy Rice Davies remarked in the Profumo case - it is clear that the same standard could be reversed and applied to Whiteley's second-hand tales. They would say that, wouldn't they... lookouts who knew that the focus for the disaster was likely to be on them in the first instance would have every reason to deflect the blame onto a stubborn and conveniently deceased officer of the watch. Even if such claims were indeed aired on the Carpathia, rather than in a lifeboat, it would not make the claims true in themselves. telling to 'He warned them three times' - a huge difference in meaning. While Whiteley's story has some accurate detail - about the number of bell-strikes for obstructions in different directions - it is also marred by error, some of it likely to be journalistic failing. One can overlook the moonlight when there was no moon, or the clumsy references to Whitney and even Whitehead when referring to Whiteley, but it is surely impossible for two lookouts, bobbing about in a lifeboat before rescue by the Carpathia, to know that anyone had shot themselves, let alone that it was the first officer. "No wonder Murdock shot himself" - it simply couldn't have been said by any lookout prior to the beginning of the storytelling on the rescuing Cunarder, and then only once the initial trauma had worn off and various pieces of tittle-tattle had been exchanged. On the Sunday morning that the Whiteley account first appeared, there was no-one to contradict it. For the following day, Monday April 22, the Herald confidently followed up its story by reporting that Whiteley had brought a "new and startling feature" into the investigation which would be "followed up immediately" by the Senate investigation. "Whiteley, who is in St Vincent's Hospital in New York, doubtless will be brought here [Washington] in the hope that the men who were on lookout duty and survived may be here. If he can identify them their testimony will be taken to throw light on the discipline aboard the vessel." But instead of setting the agenda, the Whiteley story promptly did the exact opposite and rapidly withered. He was never brought to Washington, and nor did the Senate Subcommittee follow it up immediately - or directly at any stage. Lookout Fred Fleet was examined by the US Inquiry the following Wednesday, three days after the Whiteley allegations, and the steward's "new and startling" statements simply were not raised. At the end of Fleet's evidence, Chairman Senator Smith instead made oblique criticisms of the press and declared firmly that the course of his inquiry would not be diverted in any particular direction. And so passed the Whiteley episode.... that is, it did in America. In Britain, Whiteley's allegations were not followed up. The home press kept away from the story. While the allegations certainly did nothing for the prestige of the British mercantile marine, it is possible that other newspaper instincts were at work. At a time when stories of the disaster and its ramifications were in spate, the main titles hardly felt the need to throw all caution to the wind in following up the New York Herald. They probably expected the Inquiry to investigate the story, and in the meantime there was plenty to be getting on with. So Whiteley eventually returned quietly home. By the time he apparently spoke to the North Berks Herald it might be noteworthy to observe that he had no longer been saved in a nondescript lifeboat, but had miraculously survived on the swamped Collapsible B. Never mind that no lookouts shared his precarious perch, Whiteley now remembered that someone had hit him with an oar as he tried to pull himself aboard. He had not mentioned any of this in New York, but the early reports in that city did relate that Whiteley had been dramatically "whipped overboard" from the Titanic - he knew not how - as he helped to load lifeboats with women and children. Whiteley never claimed the balance of wages owed to him by the White Star Line, unlike many of those who had returned before him on the Lapland. There is no evidence either that he gave any deposition on the disaster to the Receiver of Wreck or any solicitor for the White Star Line. He was never called to give evidence, nor paid any expenses as a stand-by witness. But he did do something unique, at least for a surviving crewman. (Limited), asked that a date should be fixed for the hearing. This story is an orphan. Nothing transpired in early March. The case does not appear in the advance warning lists in late February, as it should have done. The explanation seems obvious - it was struck out because the OSNC, trading as the White Star Line, settled. Whiteley's statement of claim cannot at present be located. Thousands of sheaves of affidavits were filed in the period when the young steward might have initiated his action. But it should be remembered that he only nineteen when he embarked on this serious course of action - and the very act of filing suit would appear to demonstrate that Whiteley was a man of strong conviction as well as steely character. His twin planks of argument, negligent steering and unseaworthiness, may be guessed at. Unseaworthiness possibly related to there being too few lifeboats for all aboard, or perhaps the fire in the bunker, or a deficiency in manning. The Mersey report presented ample grounds for argument, although the legal security of any of them is uncertain. "Negligent steering" appears to echo the New York Herald front page story in using the word 'steering' rather than 'navigation'... the latter being perhaps more encompassing of a conscious decision to enter a suspected ice field at full speed. 'Steering' seems to accept the navigational decisions but object to how they were carried out. Whether Whiteley believed what he told the New York Herald is ultimately unimportant. Whether it is capable of being true is the nub of the matter. Fleet, the sole surviving lookout following Lee's untimely death in 1913, was unlikely to be of assistance to Whiteley's case, having already given evidence at the company's behest in the landmark case for compensation involving the father of a deceased passenger, Ryan v. OSNC. (qv). Nor did Fred Fleet at any stage in his life, even when the White Star Line had long since ceased to exist, ever validate the claim that the men in the crow's nest had seen any ice prior to the fatal berg. It would thus be interesting to know the names of those whom Whiteley's side proposed to call in evidence. Bluff or not, and the OSNC were certainly capable of going far beyond a threat to call a number of nautical witnesses, it seems that ultimately the young steward won the contest. True or not, White Star had no need to have lurid claims ventilated that their Officers of the Watch were given to ignoring warning calls from their lookouts. No doubt they took the view that damaging headlines could conceivably affect bookings and their bottom line far more substantially than the relatively small outlay needed to mollify an injured steward. And thus a deal was arrived at. Honest or not, both parties thus preserved their public name. And one can only hope that Thomas Whiteley, bona fide victim of the Titanic, lived to sprightly old age.